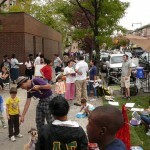 You are browsing the archives ofParking Day NYC Archives - Sustainable Flatbush. Park(ing) Day NYC, as part of a larger international movement, supports the conversion of parking spots into people-friendly public spaces for the day. Get ready for Park(ing) Day 2010! On Friday September 17th, 2010, Sustainable Flatbush will once again transform a parking space on Cortelyou Road into a beautiful temporary park for the whole community’s enjoyment.